This appendix relates to the implementation of compiler code-generators and language run-time library kernels for the Acorn RISC Machine (ARM) but is also a useful reference when interworking assembly language with high level language code. The reader should be familiar with the ARM's instruction set, floating-point instruction set and assembler syntax before attempting to use this information to implement a code-generator. In order to write a run-time kernel for a language implementation, additional information specific to the relevant ARM operating system will be needed (some information is given in the sections describing the standard register bindings for this procedure-call standard). The main topics covered in this appendix are the procedure call and stack disciplines. These disciplines are observed by Acorn's C language implementation for the ARM and, eventually, will be observed by other high level language compilers too. Because C is the first-choice implementation language for RISC OS applications and the implementation language of Acorn's UNIX product RISC iX, the utility of a new language implementation for the ARM will be related to its compatibility with Acorn's implementation of C.
At the end of this appendix are several examples of the usage of this standard, together with suggestions for generating effective code for the ARM. to give compilers a chance to optimise procedure call, procedure entry and procedure exit (following the reduced instruction set philosophy of the ARM). This standard defines the use of registers, the passing of arguments at an external procedure call, and the format of a data structure that can be used by stack backtracing programs to reconstruct a sequence of outstanding calls. It does so in terms of abstract register names. The binding of some register names to register numbers and the precise meaning of some aspects of the standard are somewhat dependent on the host operating system and are described in separate sections. Formally, this standard only defines what happens when an external procedure call occurs. Language implementors may choose to use other mechanisms for internal calls and are not required to follow the register conventions described in this appendix except at the instant of an external call or return. However, other system-specific invariants may have to be maintained if it is required, for example, to deliver reliably an asynchronous interrupt (eg a SIGINT) or give a stack backtrace upon an abort (eg when dereferencing an invalid pointer). More is said on this subject in later sections. Procedure call must be extremely fast. The standard should encourage the production of re-entrant programs, with writable data separated from code. The standard must support variation of the procedure call sequence, other than by conventional return from procedure (eg in support of C's longjmp, Pascal's goto-out-of-block, Modula-2+'s exceptions, UNIX's signals, etc) and tracing of the stack by debuggers and run-time error handlers. Enough is defined about the stack's structure to ensure that implementations of these are possible (within limits discussed later). This section defines the standard. The ARM has 16 visible general registers and 8 floating-point registers. In interrupt modes some general registers are shadowed and not all floating-point operations are available, depending on how the floating-point operations are implemented. Diverse needs can be more easily accommodated, as can conflicting historical usage of register numbers, yet the underlying structure of the procedure call standard - on which compilers depend critically - remains fixed. Run-time support code written in assembly language can be made portable between different register bindings, if it obeys the rules given in the Defined bindings of the procedure call standard. The register names and fixed bindings are given immediately below. In the obsolete APCS-A register bindings described below, sp is bound to r12; in all other APCS bindings, sp is bound to r13. Literal register names are given in lower case, eg v1, sp, lr. In the text that follows, symbolic values denoting 'some register' or 'some offset' are given in upper case, eg R, R+N. References to 'the stack' denoted by sp assume a stack that grows from high memory to low memory, with sp pointing at the top or front (ie lowest addressed word) of the stack. At the instant of an external procedure call there must be nothing of value to the caller stored below the current stack pointer, between sp and the (possibly implicit, possibly explicit) stack (chunk) limit. Whether there is a single stack chunk or multiple chunks, an explicit stack limit (in sl) or an implicit stack limit, is determined by the register bindings and conventions of the target operating system. Here and in the text that follows, for any register R, the phrase 'in R' refers to the contents of R; the phrase 'at [R]' or 'at [R, #N]' refers to the word pointed at by R or R+N, in line with ARM assembly language notation. The floating-point registers are divided into two sets, analogous to the subsets a1-a4 and v1-v6 of the general registers. Registers f0-f3 need not be preserved by a called procedure; f0 is used as the floating-point result register. In certain restricted circumstances (noted below), f0-f3 may be used to hold the first four floating-point arguments. Registers f4-f7, the so called 'variable' registers, must be preserved by callees. The APCS is defined in terms of N ( 0) word-sized arguments being passed from the caller to the callee, and a single word or floating-point result passed back by the callee. The standard does not describe the layout in store of records, arrays and so forth, used by ARM-targeted compilers for C, Pascal, Fortran-77, and so on. In other words, the mapping from language-level objects to APCS words is defined by each language's implementation, not by APCS, and, indeed, there is no formal reason why two implementations of, say, Pascal for the ARM should not use different mappings and, hence, not be cross-callable. Obviously, it would be very unhelpful for a language implementor to stand by this formal position and implementors are strongly encouraged to adopt not just the letter of APCS but also the obviously natural mappings of source language objects into argument words. Strong hints are given about this in later sections which discuss (some) language specifics. We consider the passing of N ( 0) ACTUAL ARGUMENT WORDS TO A PROCEDURE WHICH EXPECTS TO RECEIVE EITHER EXACTLY N ARGUMENT WORDS OR A VARIABLE NUMBER V ( 1) of argument words (it is assumed that there is at least one argument word which indicates in a language-implementation-dependent manner how many actual argument words there are: for example, by using a format string argument, a count argument, or an argument-list terminator). fp contains 0 or points to a stack backtrace structure (as described in the next section). The values in sp, sl, fp are all multiples of four. lr contains the pc+psw value that should be restored into r15 on exit from the procedure. This is known as the return link value for this procedure call. pc contains the entry address of the target procedure. Space between sp and SP_LWM shall be (or shall be on demand) readable, writable memory which can be used by the called procedure as temporary workspace and overwritten with any values before the procedure returns. sp >= SP_LWM + 256. This condition guarantees that a stack extension procedure, if used, will have a reasonable amount - 256 bytes - of work space available to it, probably sufficient to call two or three procedure invocations further. fp, sp, sl, v1-v6, and f4-f7 shall contain the same values as they did at the instant of the call. If the procedure returns a word-sized result, R, which is not a floating-point value, then R shall be in a1. If the procedure returns a floating-point result, FPR, then FPR shall be in f0. The definition of control return means that this is a 'callee saves' standard. The requirement to pass a variable number of arguments to a procedure (as in K&R C) precludes the passing of floating-point arguments in floating-point registers (as the ARM's fixed point registers are disjoint from its floating-point registers). However, if a callee is defined to accept a fixed number K of arguments and its interface description declares it to accept exactly K arguments of matching types, then it is permissible to pass the first four floating-point arguments in floating-point registers f0-f3. However, Acorn's C compiler for the ARM does not yet exploit this latitude. The values of a2-a4, ip, lr and f1-f3 are not defined at the instant of return. The Z, N, C and V flags are set from the corresponding bits in the return link value on procedure return. For procedures called using a BL instruction, these flag values will be preserved across the call. The flag values from lr at the instant of entry must be restored; it is not sufficient merely to preserve the flag values across the call. If ProcB merely preserves the flags it sees on entry, rather than restoring those from lr, the wrong flags may be set when ProcB returns direct to ProcA's caller). This standard does not define the values of fp, sp and sl at arbitrary moments during a procedure's execution, but only at the instants of (external) call and return. Further standards and restrictions may apply under particular operating systems, to aid event handling or debugging. In general, you are strongly encouraged to preserve fp, sp and sl, at all times. The minimum amount of stack defined to be available is not particularly large, and as a general rule a language implementation should not expect much more, unless the conventions of the target operating system indicate otherwise. For example, code generated by the Arthur/RISC OS C compiler is able, if there is inadequate local workspace, to allocate more stack space from the C heap before continuing. Any language unable to do this may have its interaction with C impaired. That sl contains a stack chunk handle is important in achieving this. (See the chapter entitled Defined bindings of the procedure call standard for further details). where x$stack_overflow is a part of the run-time system for the relevant language. If this test fails, and x$stack_overflow is not called, there are at least 512 bytes free on the stack. This procedure should only call other procedures when sp has been dropped by 256 bytes or less, guaranteeing that there is enough space for the called procedure's entry sequence (and, if needed, the stack extender) to work in. If 256 bytes are not enough, the entry sequence has to drop sp before comparing it with sl in order to force stack extension (see later sections on implementation specifics for details of how the RISC OS C compiler handles this problem). This picture shows between four and 26 words of store, with those words higher on the page being at higher addresses in memory. The presence of any of the optional values does not imply the presence of any other. The floating-point values are in extended format and occupy three words each. The return fp value is either 0 or contains a pointer to another stack backtrace data structure of the same form. Each of these corresponds to an active, outstanding procedure invocation. The statements listed here are also true of this next stack backtrace data structure and, indeed, hold true for each structure in the chain. 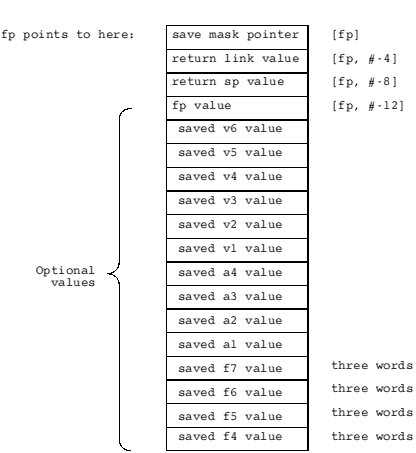 The save mask pointer value, when bits 0, 1, 26, 27, 28, 29, 30, 31 have been cleared, points twelve bytes beyond a word known as the return data save instruction. The least significant 10 bits represent argument and variable registers: if bit N is set, then register N will be transferred. The optional parts a1, a2, a3, a4, v1, v2, v3, v4, v5 and v6 in this instruction correspond to those optional parts of the stack backtrace data structure that are present such that: for all M, if vM or aM is present then so is saved vM value or saved aM value, and if vM or aM is absent then so is saved vM value or saved aM value. This is as if the stack backtrace data structure were formed by the execution of this instruction, following the loading of ip from sp (as is very probably the case). Any or all of these instructions may be missing, and any deviation from this order or any other instruction terminates the sequence. The bit patterns given are for APCS-R/APCS-U register bindings. In the obsolete APCS-A bindings, the bit indicated by ! is 0. The optional instructions saving f4, f5, f6 and f7 correspond to those optional parts of the stack backtrace data structure that are present such that: for all M, if STFE fM is present then so is saved fM value; if STFE fM is absent then so is saved fM value. At the instant when procedure A calls procedure B, the stack backtrace data structure pointed at by fp contains exactly those elements v1, v2, v3, v4, v5, v6, f4, f5, f6, f7, fp, sp and pc which must be restored into the corresponding ARM registers in order to cause a correct exit from procedure A, albeit with an incorrect result. Many apparent idiosyncrasies in the standard may be explained by efforts to make the entry sequence work smoothly. The example above is neither complete (no stack limit checking) nor mandatory (making arguments contiguous for C, for instance, requires a slightly different entry sequence; and storing argRegs on the stack may be unnecessary). The workRegs registers mentioned above correspond to as many of v1 to v6 as this procedure needs in order to work smoothly. At the instant when procedure A calls any other, those workspace registers not mentioned in A's return data save instruction will contain the values they contained at the instant A was entered. Additionally, the registers f4-f7 not mentioned in the floating-point save sequence following the return data save instruction will also contain the values they contained at the instant A was entered. This standard does not require anything of the values found in the optional parts a1, a2, a3, a4 of a stack backtrace data structure. They are likely, if present, to contain the saved arguments to this procedure call; but this is not required and should not be relied upon. RISC iX kernels running in ARM SVC mode. Although not formally required by this standard, it is considered good taste for compiled code to preserve the value of sl everywhere. When call-frame registers appear in LDM, LDR, STM and STR instructions they are named symbolically, never by register numbers or register ranges. No use is made of the ordering of the four call-frame registers (eg in order to load/save fp or sp from a full register save). sl = SL_LWM + 512. Mode-dependent stack-overflow handling code in the language-independent run-time kernel faults an overflow in module mode and extends the stack in application mode. This allows library code, including the run-time kernel, to be shared between all applications and modules written in C.
In both modes, the value of sl must be valid immediately before each external call and each return from an external call. Deallocation of a stack chunk may be performed by intercepting returns from the procedure that caused it to be allocated. Tail-call optimisation complicates the relationship, so, in general, sl is required to be valid immediately before every return from external call. In this binding of the APCS the user-mode stack auto-extends on demand so sl is unused and there is no stack-limit checking. In kernel mode, sl is reserved by Acorn. In this binding of the APCS, the stack is segmented and is extended on demand. Acorn's language-independent run-time kernel allows language run-time systems to implement stack extension in a manner which is compatible with other Acorn languages. The value of sl must be valid immediately before each external call and each return from an external call. This binding of APCS is unlikely to be used (by Acorn). There are some consequences of the ARM's architecture which, while not formally acknowledged by the ARM Procedure Call Standard, need to be understood by implementors of code intended to run in the ARM's SVC and IRQ modes. An IRQ corrupts r14_irq, so IRQ-mode code must run with IRQs off until r14_irq has been saved. Acorn's preferred solution to this problem is to enter and exit IRQ handlers written in high-level languages via hand-crafted 'wrappers' which on entry save r14_irq, change mode to SVC, and enable IRQs and on exit return to the saved r14_irq (which also restores IRQ mode and the IRQ-enable state). Thus the handlers themselves run in SVC mode, avoiding this problem in compiled code. Both SWIs and aborts corrupt r14_svc. This means that care has to be taken when calling SWIs or causing aborts in SVC mode. In high-level languages, SWIs are usually called out of line so it suffices to save and restore r14 in the calling veneer around the SWI. If a compiler can generate in-line SWIs, then it should, of course, also generate code to save and restore r14 in-line, around the SWI, unless it is known that the code will not be executed in SVC mode. An abort in SVC mode may be symptomatic of a fatal error or it may be caused by page faulting in SVC mode. Acorn expects SVC-mode code to be correct, so these are the only options. Page faulting can occur because an instruction needs to be fetched from a missing page (causing a prefetch abort) or because of an attempted data access to a missing page (causing a data abort). The latter may occur even if the SVC-mode code is not itself paged (consider an unpaged kernel accessing a paged user-space). avoiding page faults (stack faults) in procedure entry sequences. A prefetch abort is harder to recover from and an aborting BL instruction cannot be recovered, so special action has to be taken to protect page faulting procedure calls. For Acorn C, R14 is saved in the second or third instruction of an entry sequence. Aligning all procedures at addresses which are 0 or 4 modulo 16 ensures that the critical part of the entry sequence cannot prefetch-abort. A compiler can do this by padding all code sections to a multiple of 16 bytes in length and being careful about the alignment of procedures within code sections. Data-aborts early in procedure entry sequences can be avoided by using a software stack-limit check like that used in APCS-R. Finally, the recommended way to protect BL instructions from prefetch-abort corruption is to precede each BL by a MOV ip, pc instruction. If the BL faults, the prefetch abort handler can safely overwrite r14 with ip before resuming execution at the target of the BL. If the prefetch abort is not caused by a BL then this action is harmless, as R14 has been corrupted anyway (and, by design, contained nothing of value at any instant a prefetch abort could occur). Within the body of the procedure, arguments are used from registers, if possible; otherwise they must be addressed relative to fp. In the two argument case shown above, arg1 is at [fp,#-24] and arg2 is at [fp,#-20]. But as discussed below, arguments are sometimes stacked with positive offsets relative to fp. Local variables are never addressed offset from fp; they always have positive offsets relative to sp. In code that changes sp this means that the offsets used may vary from place to place in the code. The reason for this is that it permits the procedure x$stack_overflow to recover by setting sp (and sl) to some new stack segment. As part of this mechanism, x$stack_overflow may alter memory offset from fp by negative amounts, eg [fp, #-64] and downwards, provided that it adjusts sp to provide workspace for the called routine. instead of the two-instruction test shown above. The store of the argument registers shown here is not mandated by APCS and can often be omitted. It is useful in support of debuggers and run-time trace-back code and required if the address of an argument is taken. The entry sequence arranges that arguments (however many there are) lie in consecutive words of memory and that on return sp is always the lowest address on the stack that still contains useful data. The time taken for a call, enter and return, with no arguments and no registers saved, is about 22 S-cycles. Although not required by this standard, the values in fp, sp and sl are maintained while executing code produced by the C compiler. This makes it much easier to debug compiled code. Multi-word results other than double precision reals in C programs are represented as an implicit first argument to the call, which points to where the caller would like the result placed. It is the first, rather than the last, so that it works with a C function that is not given enough arguments. Call-frame registers should always be referred to explicitly by symbolic name, never by register number or implicitly as part of a register range. The offsets of the call-frame registers within a register dump should not be wired into code. Always use a symbolic offset so that you can easily change the register bindings. The Acorn/TopExpress Arthur/RISC OS Fortran-77 compiler violates the APCS in a number of ways that preclude inter-working with C, except via assembler veneers. This may be changed in future releases of the Fortran-77 product. The Acorn/3L Arthur/RISC OS ISO-Pascal compiler violates the APCS in a number of ways that preclude inter-working with C, except via assembler veneers. This may be changed in future releases of the ISO-Pascal product. These languages have their own special requirements which make it inappropriate to use a procedure call of the form described here. Naturally, all are capable of making external calls of the given form, through a small amount of assembler 'glue' code. Note that there is no requirement specified by the standard concerning the production of re-entrant code, as this would place an intolerable strain on the conventional programming practices used in C and Fortran. The behaviour of a procedure in the face of multiple overlapping invocations is part of the specification of that procedure. This appendix is not intended as a general guide to the writing of code-generators, but it is worth highlighting various optimisations that appear particularly relevant to the ARM and to this standard. The use of a callee-saving standard, instead of a caller-saving one, reduces the size of large code images by about 10% (with compilers that do little or no interprocedural optimisation). In order to make effective use of the APCS, compilers must compile code a procedure at a time. Line-at-a-time compilation is insufficient. MOVSLE  pc, lr ; and if appropriate, handle quickly! ; else, form a stack frame and handle the rest as normal code. This is only worthwhile if the test can be compiled using only ip, and any spare of a1-a4, as scratch registers. This technique can significantly speed up certain speed-critical routines, such as read and write character. At the present time, this optimisation is not performed by the C compiler. This avoids saving and restoring the call-frame registers and minimises the cost of interface 'sugaring' procedures. This saves five instructions and, on a 4/8MHz ARM, reduces the cost of the malloc sugar from 24S to 7S.